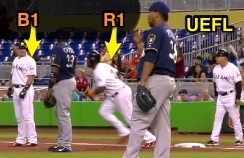 A passing the runner replay review overturned a home run in Miami, when the Milwaukee Brewers successfully challenged whether Marlins batter-runner J.T. Realmuto passed preceding baserunner R1 Marcell Ozuna during his apparent home run. The Play: With none out and one on in the bottom of the 2nd inning of a 0-0 game, B1 Realmuto hit a fly ball over the left-center field wall for a home run. As Realmuto rounded first base, preceding baserunner R1 Ozuna retreated to tag in case of a catch in the outfield. Replays indicate that Realmuto appeared to round first base—running several steps past the base, and in doing so, breaking contact with the bag—at the same moment that Ozuna stepped onto first base in anticipation of the potential tag-up play. Originally ruled legal by 1B Umpire Mike DiMuro, the ruling was overturned and the Marlins received only one run while the Brewers received one out. Question: Under the official rules of professional baseball, answer Marlins broadcaster Preston Wilson's question: "Does this affect the stat—who gets the run scored, who gets the home run? Does Realmuto get the home run and Ozuna not get the run scored? What happens here?" Once you've answered that question, answer this one: Assume the same sequence of events occurred when there were already two outs in the inning, such that the pass would have resulted in the third out of the inning. Would this affect any of the scoring decisions? Answer: The trail runner—B1 Realmuto—is declared out for passing the preceding runner—R1 Ozuna—pursuant to OBR Rule 5.09(b)(9), which states that a runner is out when, "he passes a preceding runner before such runner is out." Note that passing may occur based on the trail runner's actions or the actions of the preceding runner. Passing is an immediate out call and is not an appeal play. Scoring Rules 9.05(a)(1) and 9.06(a) indicate Realmuto is credited with a single since he touched first base and failed to touch second base before being declared out, and an RBI [9.04(a)(1)], as R1 Ozuna's ability to score a run was not harmed by Realmuto's passing activity. NOTE regarding differences between rulesets: Under high school (FED) rules, R1 would score since his awarded base trumps the third out. In other words, the time play does not apply to R1 scoring, since he was awarded free passage to home plate. NCAA rules, however, mirror OBR with regard to passed runners and time plays, so the run would not score in college ball.